30 by 22 1/2 in. 76.2 by 57.2 cm. 4 panels, overall: 96 by 288 in. 243.8 by 731.5 cm. 29 3/4 by 42 in. 75.6 by 106.7 cm. 22 1/2 by 60 in. 57.2 by 152.4 cm. 29 3/4 by 42 1/2 in. 75.6 by 108 cm. 22 1/2 by 30 in. 57.2 by 76.2 cm. 36 by 72 in. 91.4 by 182.9 cm. Mitchell-Innes & Nash is pleased to present an exhibition celebrating the work of Nancy Graves, one of the key figures of post-war art. Titled Mapping, this exhibition is timed to coincide with the 50th anniversary of the first manned mission to land on the Moon, a subject Graves explored as part of her artistic and conceptual investigation of maps. This exhibition provides an in-depth look at this aspect of her art; one that she returned to throughout her career. The exhibition will be accompanied by a fully illustrated catalogue with an essay by Robert Storr, curator of the Museum of Modern Art’s pioneering 1994 group show of the same name, which included Graves as one of the thirty artists whose work highlighted cartography as both source material and inspiration. 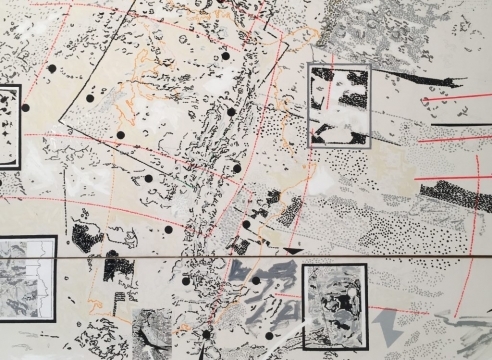 Focusing on works from the early half of the 1970s, the present show examines Graves’s increasing fascination with maps, especially with recently available satellite imagery of the Earth, Moon and Mars. The artist used these images to create paintings and works on paper that bridge the arts and sciences; representation and abstraction. This will be the artist’s third solo exhibition with Mitchell-Innes & Nash, which has represented the Estate of Nancy Graves since 2014. 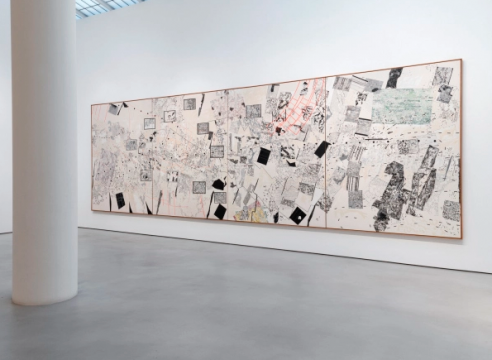 During the 1970s, Graves made a substantial body of paintings, drawings, prints and a film that delved into the systems that underlie the production and legibility of maps. While her earliest works were based on illustrations selected from ethnographic studies of Polynesian and Inuit navigational maps, Graves’s formal engagement with mapping took a new direction when she chose to depict detailed images of the topographies of Mars, the Moon, Mercury and Earth’s ocean floors based on data transmitted by orbiting satellites, then a pioneering technology. Ineffably removed, and unverifiable through direct experience, these distant locales were suddenly made visible through newly available NASA recording technologies such as bathymetric measurement, electronic video transmission and computer analysis. Graves’s profound decision to include visual references to the satellite recording and transmission technologies themselves ultimately emphasized the arbitrariness of the images that they produced. 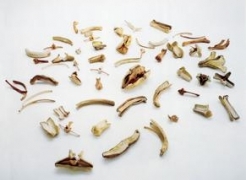 Despite, or perhaps because of, Graves’s detailed renderings of this scientific data, her paintings and drawings reveal these sources as expressive abstractions. Indeed, the works in this exhibition seize upon the map as an idea in which abstraction and representation overlap. In laying out un-seeable sources and an imperfect means of transmitting information, Graves raises questions about the literal authenticity of science and asserts the importance of the artist’s intuition. Along with drawings and prints, the exhibition will include approximately six important paintings, including one of Graves’s largest and most complex pieces, Mars (1973), which measures 24 feet in length. On view in the United States for the first time in 45 years, this monumental work depicts the topography of the red planet based on NASA satellite data. Graves created this four-panel painting just as NASA was making images from the first Mars mission public. In contrast to the Moon, much less was known about the surface of Mars, and the painting’s fragmented overall composition conveys the density and diversity of, as well as the lapses in, visual information that was being transmitted from space. A further highlight of the exhibition will be Indian Ocean Floor, II, which is based on bathymetric recordings of the ocean floor by satellites that revealed previously unknown topographies on our own planet. Several works on paper, many of which have rarely been shown, will be exhibited alongside the paintings. For her part, Graves gazed wider still as well as higher and deeper, trying to capture the marvelous variety and immensity of environs, near and far, in a variety of formal modes beginning with sculpture and film, and ending with sculpture. In the middle of an all-too-short career she looked to painting to take the accurate measure of things that are all but incalculably vast. And she vividly succeeded. Mitchell-Innes & Nash is also pleased to inaugurate its online viewing room with a selection of works on paper by Nancy Graves as well as an exclusive showing of the artist’s film, Reflections on the Moon (1974). In New York, these bodies of work are now on view in “Nancy Graves: Mapping” at Mitchell-Innes & Nash, and “Shape Shifter,” a solo exhibition of work by Mary Beth Edelson at David Lewis Gallery. With Graves taking a scientific approach while Edelson a more spiritual path, the exhibitions show two women grappling with these ponderous questions at a critical historical moment. 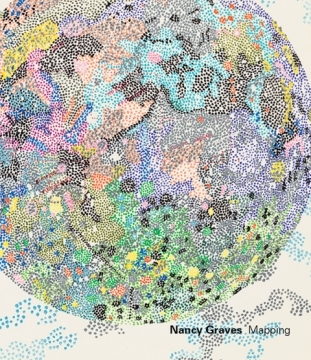 Nancy Graves’ art explores the connections between art, science, technology, and geography. 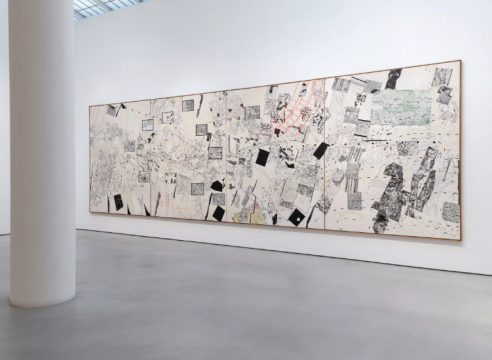 Her early 1970s conceptual paintings and drawings inspired by technological progressions in cartography, such as satellite imagery of the Earth, Moon, and Mars, are currently on view at Mitchell-Innes & Nash‘s Chelsea location in New York City through April 6, 2019.